Impact Wear of Materials is entirely devoted to quantitative treatment of various forms of wear occurring in impact-loaded mechanical components. 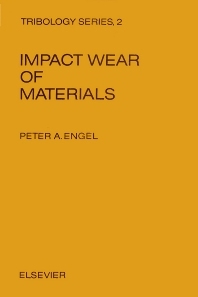 Impact wear is classified under two headings, namely erosive' andpercussive' wear. In erosive wear, particle streams and liquid jets are discussed. The subject is developed with emphasis on material relations, stress analysis and the historical progress of research. In percussive wear, a wide variety of wear mechanisms is described. The author's experimental/analytical work created the groundwork for a general procedure of impact wear-law formulation, combining impact analysis with the physical wear mechanism. Ballistic impact and pivotal hammering, compound impact, the optimal wearpath, lubrication, plasticity, and flexible media are some of the topics considered. The book develops a new conceptual approach to impact, impact-originated wear and wear in general. It describes and utilizes the modern tools of observation in wear science. In mechanical analysis it emphasizes quantitative treatment, using such tools as finite element stress analysis, APL programming language etc., each applied with classic simplicity. Numerous photographs, tables, figures and examples are used throughout the text and the mathematical treatment strives for simplicity and conceptual clarity. The book is of value to mechanical component designers, analysts and researchers. It is also useful in science and engineering curricula at senior and graduate level and, although its appeal is primarily in tribology, machine design and materials science, its interdisciplinary language makes it accessible to any branch of the physical sciences and engineering. Considerations of Friction and Wear. 2. Methods of Impact Stress Analysis. 3. Impact Response of Engineering Surfaces. 4. Erosion by Solid Particles: Ductile and Brittle Theories. 5. General Aspects of Solid Particle Erosion. 6. Experimental Background of Percussive Impact Wear. 7. The Zero Impact Wear Model. 8. Measurable Impact Wear Theory. 9. Impact Wear in the Plastic Stress Range. 10. Impact Wear Through Flexible Media. 11. Liquid Erosion. Appendices: 1. Computer Programs in APL Programming Language. 2. Elastic Contact Solutions. 3. Hardness Tests. 4. Surface Texture. Author Index. Subject Index.